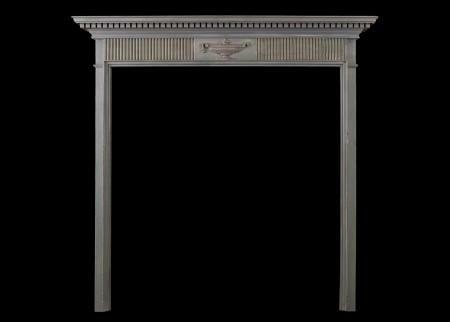 Thornhill Galleries offers a broad selection of period Regency fireplaces. Following on from the Georgian period, Regency style expanded the classicism of the former. Napoleon’s expeditions in Egypt extended the design palette from the already popular Greek and Roman classical motifs and added to it Egyptian inspiration and elements of French Rococo design. The Prince Regent himself was a patron of the arts whose tastes influenced and inspired the fashions of the day. Despite flamboyance in other elements of interior design, chimneypieces tended to be more elegant and simple with a focus on classicism and the natural world with subtle embellishments. With similar focus on entertaining to the Georgians, Regency mantelpieces tended to become more excessive depending on the size of the room in which they were placed, meaning that the fire surround would always have been the center of Regency social life. 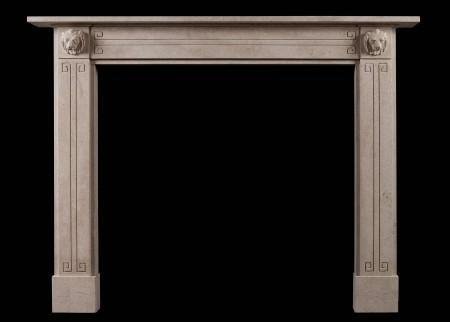 For more information on our antique Regency fireplaces, please get in touch. 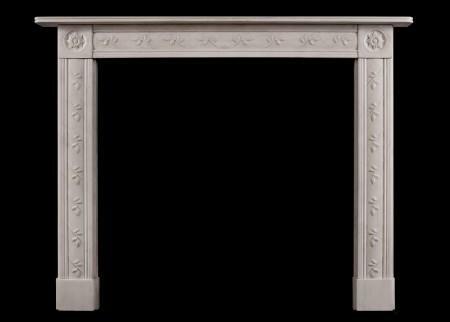 A Regency style white marble fireplace. The tapered, reeded jambs surmounted by finely carved swirling finials. The frieze with convex reeding throughout. Plain shelf above. An elegant piece, well suited for smaller Drawing Room or Bedroom. Modern. N.B. May be subject to an extended lead time, please enquire for more information. 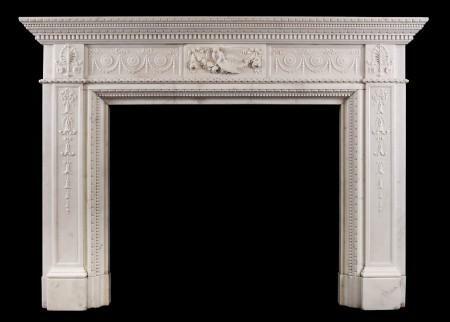 An English white marble fireplace in the Soanian manner. 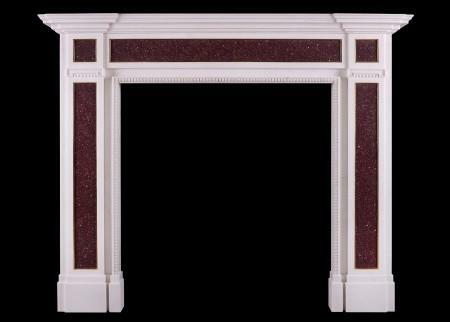 The reeded moulding to jambs and frieze with centre plaque and arched end blockings. A fine copy of an original piece. N.B. May be subject to an extended lead time, please enquire for more information. A simple yet elegant white marble fireplace in the Regency style. The fluted jambs surmounted by carved rosette paterae above. The frieze with flutes throughout. Moulded shelf above. English, modern. A white marble fireplace in the manner of Sir John Soane. The tapering jambs with Greek key decoration, surmounted by square panelled blockings. Plain frieze and shelf. English, based on an original piece. 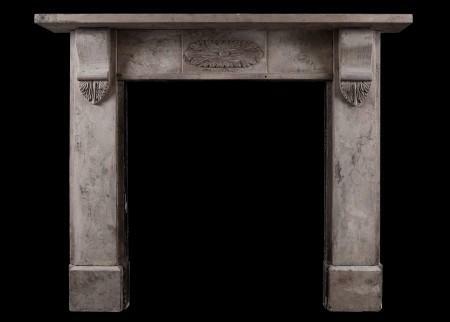 A white marble fireplace in the late Georgian style. The frieze with carved centre blocking featuring quiver, torch and tied ribbon, with carved lyres to end blocks. Panelled frieze and jambs, and breakfront moulded shelf above. Based on an original piece. An attractive English Regency fireplace in white marble. The jambs and frieze with Greek key motif, the end blockings with carved lion’s masks with moulded shelf above. A fine quality copy of a period original. 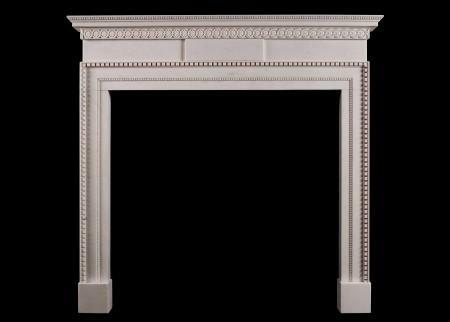 An attractive English Bath stone fireplace in the Regency style. The jambs and frieze with Greek key motif, the end blockings with carved lion’s masks with moulded shelf above. A fine quality copy of a period piece. An English Bath stone fireplace in the Regency style. The panelled frieze and jambs with Greek key motif surmounted by Anthemion leaf. A good quality copy of an original piece. 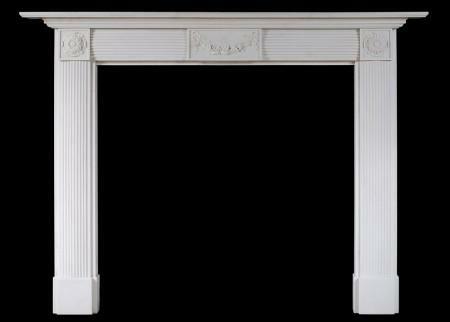 An English white marble fireplace in the Regency style. The panelled jambs with bowed reeding to returns and carved wreath with tied ribbons. The panelled frieze surmounted by reeded shelf above. A good quality copy of a period piece. An attractive English Regency style white marble fireplace. The frieze with flowing vines and grapes, and the jambs with tapering pilasters with tie ribbons with vine leaves trailing below. The side blockings with unusual flower motif paterae. The shelf with crisp egg and dart moulding. 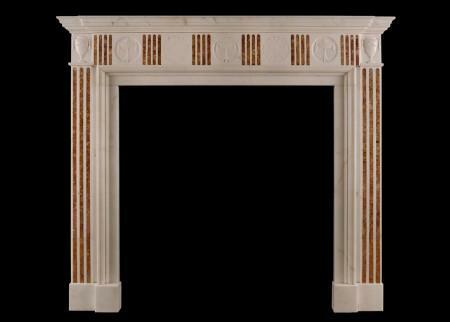 An English Regency style fireplace in white marble with Siena inlay. The frieze and jambs with half rounded reeds, the end blockings with delicate rosettes encircled by carved garlands. Moulded breakfront shelf. A fine quality reproduction of an earlier original. 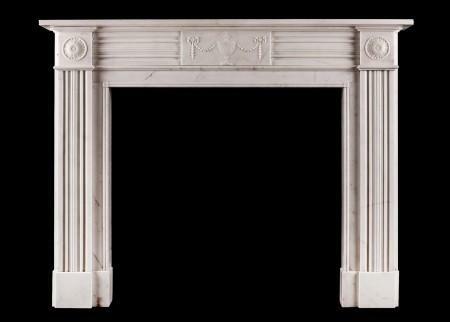 An English white marble fireplace in the early 19th century Regency style. The frieze with raised and fielded centre panel, the tapering reeded jambs surmounted by carved square paterae. Reeded shelf. An English white marble fireplace in the Regency style. The jambs and frieze with matching bowed flutes and carved rosette paterae, the frieze with carved centre panel with swags and flowers. Stepped, moulded shelf. A good quality copy of a period piece. 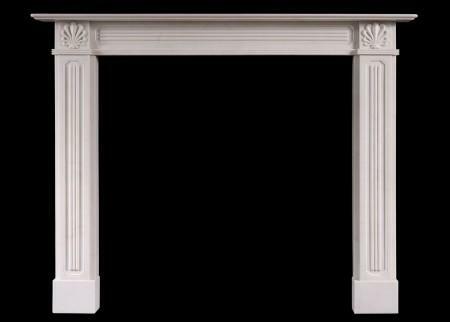 A Regency style white marble fireplace with reeded and ribboned frieze and jambs. The carved centre panel depicting a scene of Androcles and the lion, with associated lions heads to side blockings. Reeded shelf. A copy of an early 19th century original. The moral of this fable, reputedly by Aesop, celebrating the the reciprocity of kindness and friendship between man and beast, whereby an escaped slave helps a wounded lion and is then later spared by the same animal, is that ‘gratitude is the sign of a noble soul’. 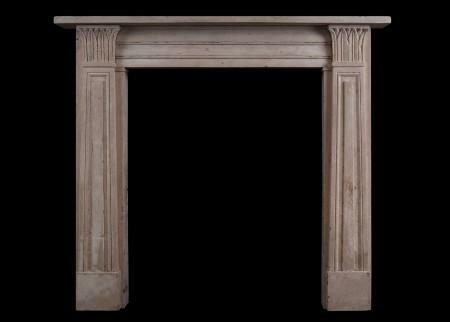 A charming Regency style white marble fireplace, with delicately carved anthemion side blocks. Octagonal panels to frieze and jambs with reeded centres. Reeded moulding to underside of frieze, and moulded shelf. A copy of a period English Regency original. 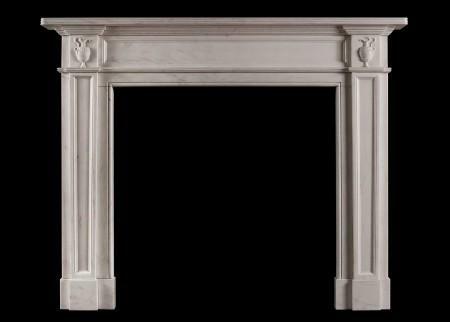 A delicate English Regency white marble fireplace. The reeded frieze and jambs with carved floral motif to centre. Round paterae of floral design to end blockings. Reeded shelf. A quality copy of an original piece. 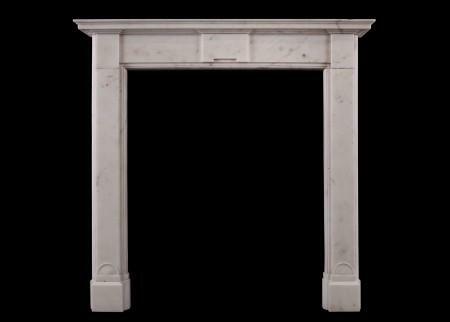 A fine quality English Regency style fireplace in white marble. The jambs with tapering reeded columns surmounted by end blockings with carved pateras. 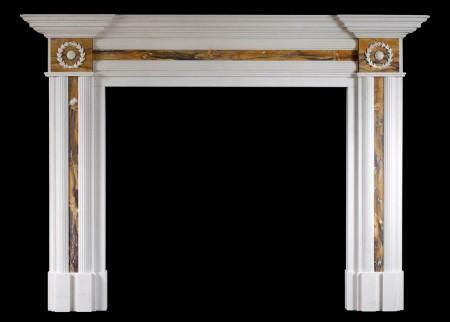 The reeded frieze with panelled centre tablet. A copy of a period original (circa 1820). 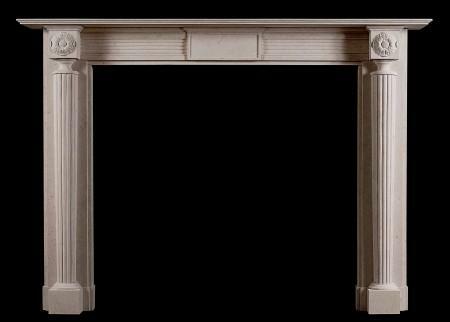 A fine quality English Regency style fireplace in limestone. The jambs with tapering reeded columns surmounted by end blockings with carved pateras. The reeded frieze with panelled centre tablet. A copy of a period original (circa 1820). 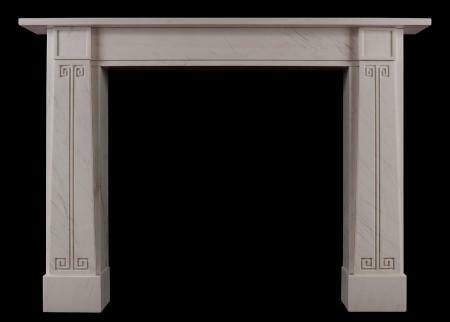 A Regency style fireplace in white marble. The tapering panelled jambs surmounted by classical urns to side blockings, the panelled frieze surmounted by reeded shelf above. A copy of an earlier piece. 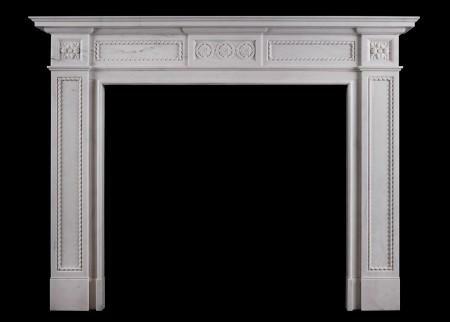 An English white marble fireplace in the Regency style. The fluted panelled frieze bordered by beads, shaped fluted jambs surmounted by carved round paterae and beading. A quality copy of an original piece. A well proportioned white marble fireplace in the Regency style. The panelled jambs and frieze with inlaid Porphyry and gold leaf inner trim. Carved egg-and-dart moulding to unground. Moulded shelf above. Early 20th century. A white marble fireplace in the Regency style. The fluted jambs surmounted by finely carved paterae, the frieze with centre block featuring swags, flowers and classical urn. Reeded shelf above. English, circa 1900. 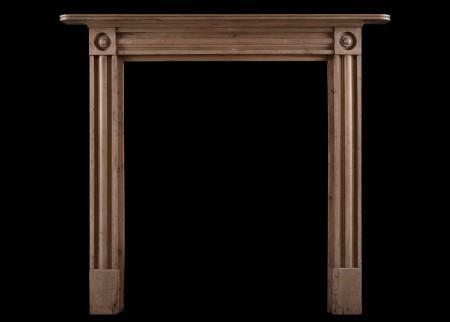 A small and delicate wood fireplace in the Regency style. The jambs surmounted by fluted frieze with carved classical urn to centre. Moulded shelf above. English. Currently painted light blue with elements of gold leaf effect behind. Could be stripped if required. Some minor restorations required (included in price). 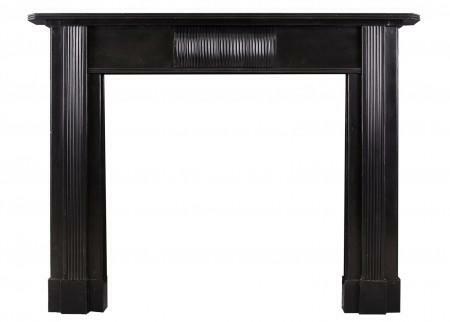 An English Regency marble fireplace in black Kilkenny marble. The reeded jambs surmounted by plain frieze with accompanying reeded centre block. Shaped shelf above. Part of a near pair with Stock No. 4304. A striking piece in an increasingly rare fossil marble. 19th century. 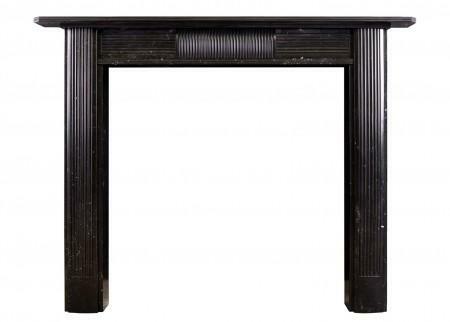 An English Regency marble fireplace in black Kilkenny marble. 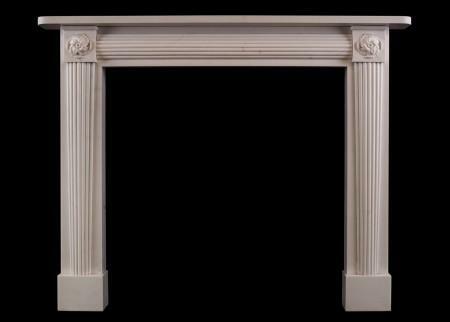 The reeded jambs surmounted by plain frieze with accompanying reeded centre block. Shaped shelf above. Part of a near pair with Stock No. 4305. A striking piece in an increasingly rare fossil marble. A Regency antique fireplace in Italian Statuary white marble. The jambs surmounted by moulded frieze with delicately carved rosettes. Moulded shelf above. English, early 19th century. 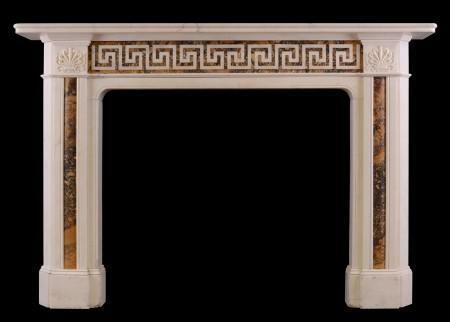 A Regency style fireplace in Statuary marble antique fireplace with Sienna Brocatelle inlay. The fluted jambs surmounted by urns of classical form. The frieze with matching flutes, interspersed with rosettes with carved urns and foliage. English, 19th century. A fine quality Statuary marble late Georgian fireplace. The panelled jambs with finely carved bellflowers and ribbons, surmounted by rope moulding and end blocks with Anthemion leaf. The frieze with rosette paterae and drapery throughout, with carved centre block featuring intertwined birds, flowers and ribbons. The shelf with carved dentils, leaves and beading. A good quality, striking piece. English, 19th century. 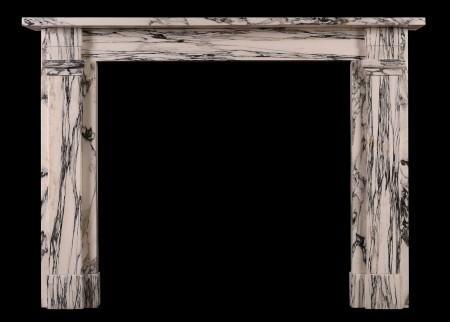 A period Regency Statuary marble fireplace. Plain jambs and frieze with centre panel. Moulded shelf above. English, 19th century.